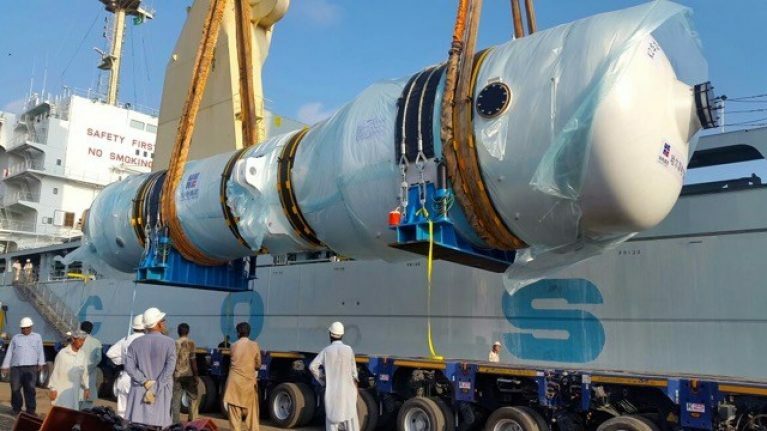 KARACHI: Project cargo specialist Star Shipping recently completed the transfer of a module weighing 80 tons from a COSCO breakbulk vessel at the Port of Karachi to a city construction site – part of the long-term China Pakistan Economic Corridor (CPEC). Founded in 2004, Star Shipping moves conventional, break bulk, over dimensional and over weight project cargoes. In this case the offload was 14.0 x 4.0 x 4.0 meters onto a multi axle hydraulic trailer. CPEC is a collection of infrastructure projects currently under construction throughout Pakistan at a cost of US$62 billion. The bilateral agreement between China and Pakistan is intended to rapidly modernize Pakistan’s infrastructure and strengthen its economy by the construction of modern transportation networks, numerous energy projects and special economic zones. According to Pakistan’s minister for the Interior Ahsan Iqbal, CPEC is a major opportunity for Pakistan to transform itself as an economic nation and become a regional hub for trade, commerce and manufacturing. “Without industrialization we cannot resolve many of our socio-economic problems, and CPEC represents a fantastic chance to become an industrialized country,” he declared.